Header-Lateral or Hub-Lateral Collector/Distributors fabricated with wedge wire are superior screens for retaining media in vessels of all types, i.e. 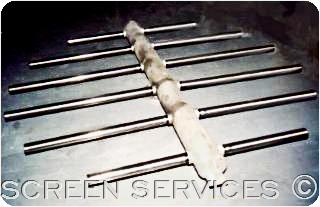 ion exchangers, carbon towers, clay filters, sand filters, and numerous other liquid-solid retention applications. Wedge wire screens have maximum design flexibility, can be constructed in a wide variety of shapes and sizes from a variety of corrosion resistant alloys such as type 304, 316, 316L, 321, and 410S stainless steels, as well as nickel alloys such as C-276. Any process or vessel requirements can be accommodated, such as vertical or horizontal vessels. For a quotation on replacement laterals, please download, fill in, and send us a copy of our Quote Request (121K) form (Adobe Acrobat format).